I have always had a huge interest in creating something with my hands. In school, handicraft lessons were the highlight of my week and as an elective course, I chose “Young Creativity” of course. After elementary school I started an esthetic basic course “Art and Design” at the textile line. Here, I had the opportunity to try a lot of different crafts such as felting, knitting machines, assembly, pattern rapports etc. Today, I am a full time machine operator at a surface treatment company, and in my spare time, crocheting is my passion. During the evening when I am crocheting, I am in my own little creative bubble. I love to play with colors and see how my designs develop round after round. Often, new ideas are created while I am crocheting on another design. 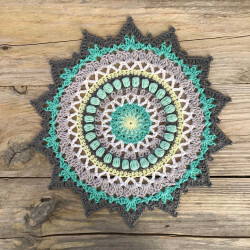 In collaboration with Svarta Fåret, I have designed leaflet patterns for crocheted blankets, table cloths and pot holders in a Mandala theme. 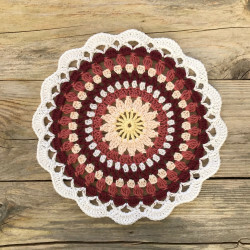 In collaboration with Hobbii, I design crochet patterns which you can find for free here at Hobbii. On my blog crochetmillan.com I share my crochet patterns in both Swedish and English. 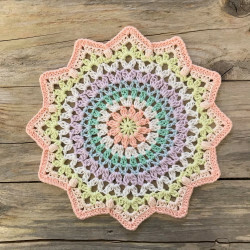 If you seek inspiration, you are welcome to visit my Instagram profile crochet Millan.